Ecuador has reduced poverty and inequality in recent years, but now it is looking to go one further by emulating the most successful Latin American country of them all: Brazil. 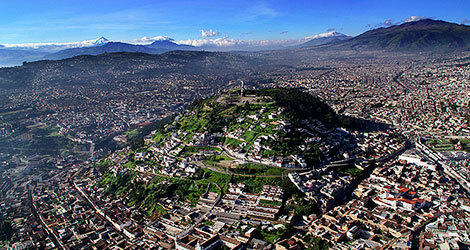 The Ecuadorean capital, Quito. Photo courtesy of Romulo Fotos. Ecuador has made considerable progress in poverty reduction and social spending since the rise of Rafael Correa to the presidency in 2006, but the government has made its latest move to ensure that this trajectory can continue in a sustainable fashion – by looking to Brazil for inspiration. Several Ecuadorean ministers travelled to Brazil along with President Correa, and held meetings with various Brazilian ministers in order to gain a deeper insight into the success that the South American giant has had over the past decade in lifting tens of millions of people out of poverty, while implementing various social programmes centred around health and education. “Social policy in Brazil and Ecuador has a lot in common”, the Ecuadorean Minister of Social Development, Cecilia Vaca Jones, told reporters back in her country’s capital Quito. She added that objectives such as “eradicating poverty and achieving greater equality” imply “the understanding of poverty as a multidimensional thing”, giving rise to the need for sophisticated and well-targeted campaigns such as those that have been carried out in Brazil. 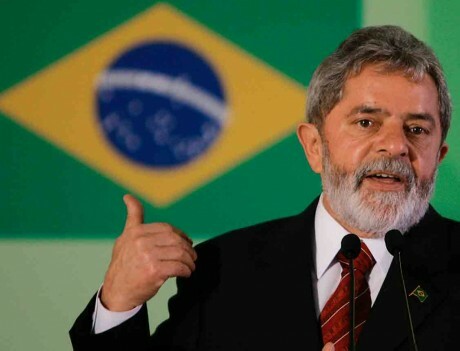 The former President of Brazil, Lula da Silva, who is credited with kickstarting Brazil’s success in poverty reduction. Photo courtesy of Veja. Since the Partido dos Trabalhadores (PT – Workers’ Party) came to power in 2003 under the leadership of the charismatic President Lula da Silva, the Brazilian government has embarked on a series of ambitious anti-poverty initiatives, most of which fall under the umbrella Fome Zero (Zero Hunger) and Brasil Sem Miséria (Brazil Without Poverty) schemes. The best-known of these initiatives is the Bolsa Família (Family Allowance), whereby the government hands low-income families a monthly cash allowance on the condition that their children have excellent school attendance and get regular medical check-ups. In this way, the scheme not only addresses extreme poverty by guaranteeing Brazil’s poorest households a stable monthly income, but it also encourages children to receive the best education and healthcare possible, boosting their chances of future social mobility. It is the largest conditional cash transfer (CCT) programme in the world, covering 26% of Brazilians as of 2011, and has been credited with a 20% drop in inequality in Brazil as well as the lifting of as many as 50m people out of poverty. For these reasons, it is no surprise that Ecuadorean officials are keen to mimic the set-up of Brazilian social welfare policies and try to emulate their successes, just as numerous other Latin American countries have done over the last decade. To this end, Vaca Jones expressed her opinion that “poverty is a multidimensional problem, that isn’t just about resolving the economic income, education, or living situation of a person”, but by putting in place “a combination of actions from different sectors” that create equal opportunities for all. Vaca Jones also highlighted the success that Brazil had had in fighting malnutrition, adding that this was not just a fight for better health but that it also had positive knock-on effects on children’s education. Furthermore, she praised Brazil’s programme of establishing a network designed to help women, including a mechanism that makes it easier for women to safely report instances of sexual violence – a problem that is still rife within Brazilian society. During the trip, Vaca Jones and several other ministers from both Ecuador and Brazil signed a deal on technical cooperation between the two countries, which aims to make the most of the vast experience in social policy enjoyed by members of the PT government, which has remained in power since 2003, after Lula’s time in office ended in 2010 and he was succeeded by the current President, Dilma Rousseff. The agreement was signed by Vaca Jones, the Ecuadorean Health Minister Carina Vance, the Ecuadorean Social Inclusion Minister Betty Tola, and the Brazilian Health Minister Arthur Chioro. Rafael Correa, President of Ecuador, has overseen a sharp reduction in poverty figures since coming to power in 2006. Photo courtesy of AP. Ecuador has now reached, for the first time in its recorded history, an extreme poverty rate of below 10%, with the latest figures indicating the level stands at 8.5%. The standard poverty rate has dropped from 37% to 25.6% since Correa came to power in 2006, which adds up to 1.1m people being lifted out of poverty, and the government has set itself the task of eradicating extreme poverty by the end of his current term in 2017. However, there is still much to be done, especially with 25% of children under the age of five still suffering from chronic malnutrition, something which, as Vaca Jones pointed out, goes a long way towards ensuring the perpetuation of poverty and exclusion among the poorest sectors of society. Ahead of the visit, Vaca Jones had declared: “We’re breaking the cycle of poverty and getting rid of the profound inequality that used to exist in our country”. President Correa, meanwhile, had previously stated that the Brazilian social welfare model was a “very successful” one, before adding that while Ecuador already had social programmes of its own, “the difference is that we are a nation of 15m inhabitants whereas in Brazil there are 200m. It’s much more difficult to manage a country like Brazil but in some areas they do have an advantage over us, such as in the consolidation of their social programmes”. Correa had been in Brazil in order to attend several other international summits, but alongside the meetings involving Vaca Jones the Ecuadorean President was also able to meet with the Brazilian Social Development Minister, Tereza Campello, who was able to give Correa himself the full low-down on the workings and virtues of the Brazilian anti-poverty programmes and the ways in which those positive experiences could be transferred across the Amazon to Ecuador.